Discover the Battle House Renaissance Mobile Hotel & Spa, a downtown Mobile luxury hotel located in the Central Business District across from the Mobile Convention Center. This AAA Four Diamond downtown Mobile hotel has been a favorite of entertainment celebrities, sports legends, a president, and a king since 1852. 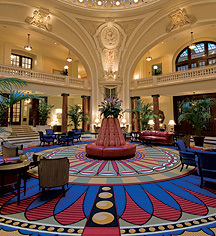 This landmark hotel in Mobile was thoughtfully resorted to it original grandeur and is a proud member of Historic Hotels of America. 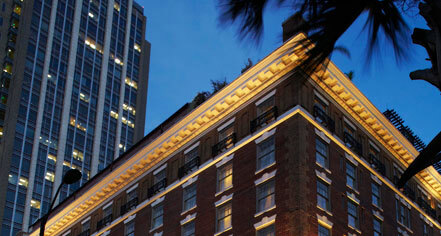 This legendary AAA Four Diamond Hotel also offers The Trellis Room, Mobile's only Four Diamond Restaurant. The Spa at the historic Battle House Renaissance Mobile Hotel & Spa is a 10,000 sq. ft., oasis boasting a full salon, eight treatment rooms, and a Zen-like fire pit in our spectacular, tranquil Quiet Room. Host unforgettable events in a historic setting inside the magnificent Crystal Ballroom and marvel at the whispering arches acoustical feature. Guests enjoy Mobile's Living Room, located just steps from Mobile's Historic and Entertainment District, the Historic Oakleigh District, Gulf Coast Exploreum & Imax, the Carnival Museum, USS Alabama, Museum of Mobile, New Year's Eve Moon Pie Drop, Senior Bowl Museum, and Fort Conde. Battle House Renaissance Mobile Hotel & Spa, a member of Historic Hotels Worldwide since 2014, dates back to 1852. Established on the site of a military headquarters set up by Andrew Jackson during the war of 1812, the hotel also served as a Confederate hospital during the Civil War. Early Check-In/Late Check-Out: Express Check-In and Express Checkout. Parking: Valet: $19.00. Other: Day Valet Parking $14.00. Pet Policy: Service animals allowed: Yes. Pets allowed: Yes. Deposit: $75.00 (Non-Refundable). Maximum 2 pets per room. Dogs, cats, birds accepted. Discover the Battle House Renaissance Mobile Hotel & Spa, a downtown Mobile luxury hotel located in the Central Business District across from the Mobile Convention Center. This AAA Four Diamond downtown Mobile hotel has been a favorite of entertainment celebrities, sports legends, a president, and a king since 1852. Learn more about the History of Battle House Renaissance Mobile Hotel & Spa .